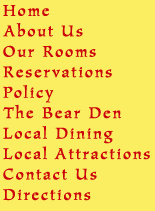 El Oso Flojo Lodge is about 5 miles south of I-10 junction 206, located in the town of Balmorhea. The historic town of Fort Davis is south about 30 miles on route 17. A little history on Balmorhea. 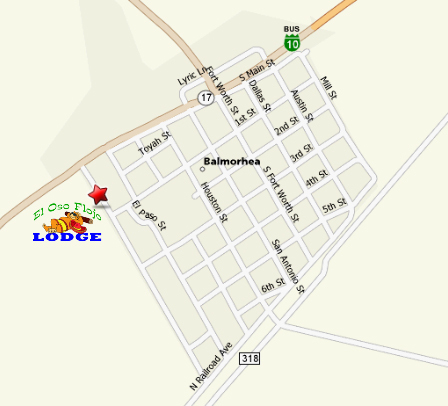 Balmorhea is on Toyah Creek, the Pecos Valley Southern Railway, Farm Road 1215, and U.S. Highway 290, one mile southwest of Brogado in southwestern Reeves County. Indian and Mexican settlers farmed around the area from early times, taking advantage of the good supply of water from nearby San Solomon Springs. The town was laid out in 1906 in the center of a 14,000-acre tract watered by the springs. Balmorhea was named for the three land developers who sent their agent, Ira M. Cole, to file the plat for the town site. Their names were Balcum, Moore, and Rhea. A public school was organized, and a post office opened in 1908. In 1911 the Pecos Valley Southern laid its tracks from Pecos to Toyahvale through Balmorhea, and a hotel was built in the town that same year. In 1925 fifty people were reported living in Balmorhea, and by 1927 that number increased to 500. A bank opened in 1928 and operated until 1933. The population reached 1,220 in the 1930s, and the number of businesses bounced between twenty-five and thirty-three. A gradual decline began after World War II. Throughout the 1950s and most of the 1960s the population was around 600, and the number of businesses declined to nineteen. In 1961 the town was incorporated. In 1968 Balmorhea had a population of 1,009 and thirty businesses. By 1988 it had four businesses and a population of 528. The 1990 United States census set the population of Balmorhea at 765. In 2000 the population dropped to 527. Balmorhea State Recreation Area is located at San Solomon Springs.